The story in the Denslow book was a bit strange – the wise hen telling an egg that it was a good idea to be boiled so he wouldn’t break. I think the point was that a child needs to toughen up a little so he can grow up and become a productive member of society. Anyway, this was a fun, spur-of the moment project that is very different from my usual style, but I had a lot of fun with it. If you’d like to make a giant Easter egg instead, the plaster cloth over the balloon and under the paper mache might be worth considering – it’s really strong, and it went together fast. If you don’t have a hobby store near you, you can order plaster cloth from Amazon.com. I love it! Great job – thanks for sharing. Jonni = this is my first view of your very cute Humpty Dumpty. I am going to make one using your instructions – what do you suggest = paper strips or Jonni clay? Hi Joanne. You can use either one – I used the paper strips on this one, because the plaster cloth provides all the support you need, and the paper mache was just added so I could have a nice flat surface. And it went on really fast. But a very thin layer of the paper mache clay would have worked just as well. Use whichever one you’re in the mood for. And be sure to let us see how it comes out! Pumpkin carving is part of my interest in originally getting into paper mache since unlike pumpkins it yields a permanent product. What a great pumpkin, Rich. It must have been sad to see him disintegrate. Will you be making another, more permanent, Humpty Dumpty? Thanks Jonni. 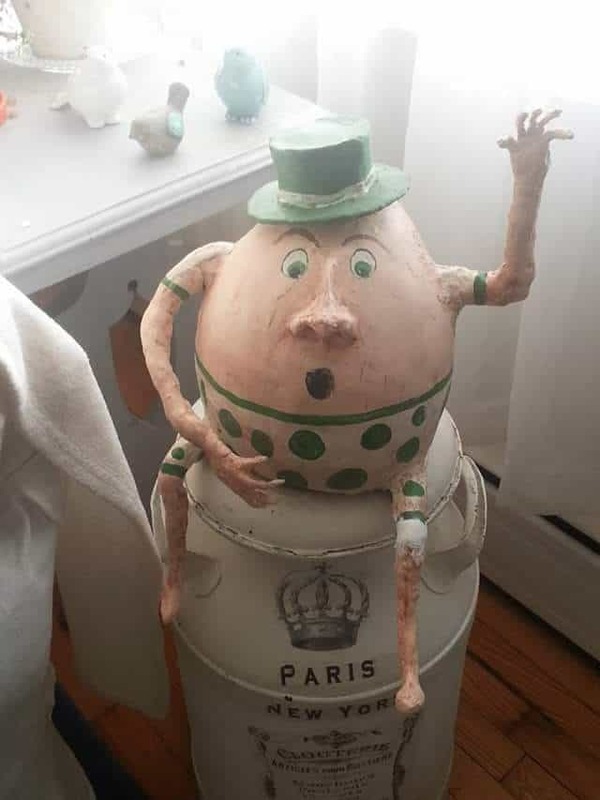 Yes, creating a paper mache clay Humpty Dumpty, sort of in the style of the heads I have been posting, is one of my many planned projects. 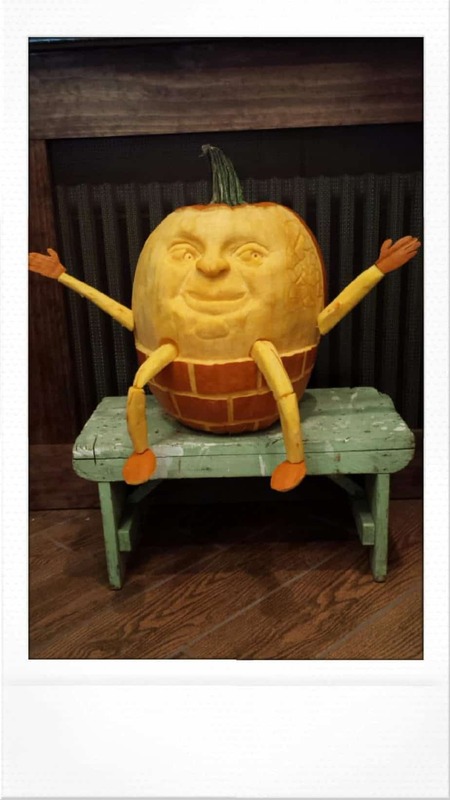 I love working with pumpkins, and they have been for me part of the way some of my sculpting abilities have developed, but I look forward to creating more permanent creations. I am delighted to have found your videos and website. I challenged myself to make the American Girl Egg Chair (for 18-inch dolls). I need to smooth out the exterior and upholster the interior. I’m thinking of using your homemade gesso. This egg has two layers of plaster cloth, and while a third layer might be advisable, keeping costs low is a requirement! If you have a suggestion on a better way to smooth out the surface. I’d welcome it and any other suggestions. Thanks. Hi Linda. I think you have a good plan, and it should work well. If you need the egg to be stronger, you could add a layer or two of paper strips and paste made from flour and water – traditional paper mache. It’s quite strong, and would cover the bumps left by the plaster cloth. Be sure to post a photo of your Egg Chair when it’s done! 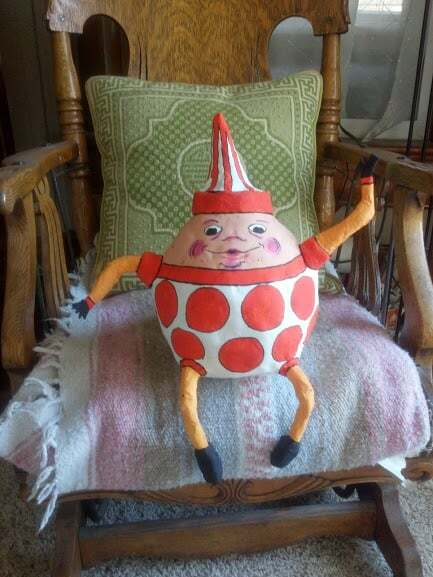 I love your humpty, always been a big fan of the fellow and I might just have to try making one now! Sonya, you could make your form with paper, and even use a cardboard template inside, if you then cut the paper mache apart all the way around, and then stick it back together. If you use a first layer of plaster cloth like I did with Humpty (and the dragon’s head) you can then stick it back together with a few small strips of plaster cloth and cover it with paper mache. The seam would be invisible. You can do the same thing with just paper strips and paste, of course, but you would need to make sure you had enough layers of paper mache so the shape isn’t distorted when you take it apart. That Humpty Dumpty is sooo cute! I have not done paper mache for many years…but I am struck with an inspired project, and would like to begin today. I would like to explain a bit about it and ask your advice. Hi Karen. I’m sure you’re started on your project already – this has been a busy day for me, so it took a while to find your comment. If you cut through the paper mache to take it off the wig form, the Styrofoam may be slightly damaged by the knife. Will that matter? If so, you might be able to make a cardboard barrier between the two halves, use some sort of release (oil and water mixed, petroleum jelly) over the wig form and the cardboard barrier. Then add the paper mache up to the cardboard. When it’s fully dry, carefully pry it off and put it back together with strips of paper and paste. Or the plaster gauze, which would be much faster. By far the easiest thing is to use a craft knife and cut the seam after the piece is hard and dry. But, like I said, that will leave a cut on the surface of the foam. If you’re using the plaster bandages, they might not stick to the foam, but I’d use a release anyway, just to make sure. Well here is my attempt at creating a Humpty Dumpty. Not exactly what I was hoping for. What is this? Lol! I am not sure if he is an M&M, a fat peanut or The Blob. I decided to give him sculptured features because I am not very good at painting faces. This certainly changed his character. I do like him and my family thinks he has personality. Jonni thought you all might have an idea of what I could call him. All suggestions are welcomed. Have a great day! Sooo cute! I think he’s kind-of-a… “egg yolk”.. haaaa…get the yolk? Love him! Such a cute face and really love his dapper little hat. I also like that you chose to be different with your, make it your own, and add 3D features. Thank you Deborah. He brings a smile to my face each time I walk past him. 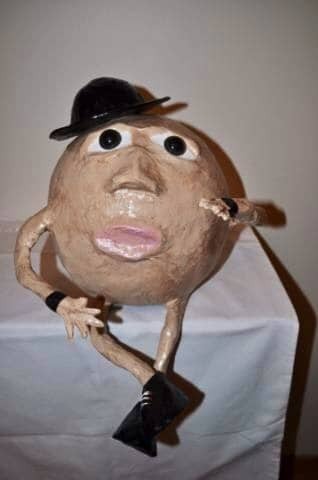 I’ve started thinking of him as the Round Man. Although he does look like a Harvey as Jonni suggested. Thanks for your help on Mr. Dumpty. I had to go with paper mache as I couldn’t find the plaster cloth in my small town. Maybe I will order some for my next project! I had a lot of fun with this. Now I am going to make one of your rabbits…all I have to do is decide which one? Jonni, I’m speechless. I have made a dozen balloon banks, at least, and I have never liked balloons as a base. When you put plaster cloth over the balloon, I about died. I don’t know whether to be in awe or in anger! It is such pure and simple genius. That would work so much better than fighting the “air” problems with a balloon covered with paper mache. (I’ve had everything from expanding to shrinking.) Anyway, if I do a balloon again, plaster cloth will be a god-send. I’m about 20 years behind you! I loved Humpty, and I never knew anything other than the nursery rhyme. Fascinating. Loved you related that story, especially the boiled egg part. A few years ago I read 100 nursery tales, and most of them are quite gruesome. You know, a little girl sits under a tree and a spider bites her and she dies! Hardly what we’re used to. Thanks so much. I am in awe of what you do. I can’t tell you how much I love the egg. I will never get mine done before Easter – even if I let the yard and planting go! Wow! What an experience. I love watching you work. What a great gift you have and share. Your Humptey is wonderful, has your grandson seen it yet? I bet he will get a kick out of it. You mentioned how in the story the farmer’s wife wrapped him in calico and that got me wondering…have you ever tried using cloth as the final covering? I wonder if cloth would be able to be sealed as well….just thinking of another experiment. You have us all doing it now. Jonni, its funny that you mentioned Dan Reeder and his use of latex paint. I was just rereading about that last night for someone. In addition to what you said, he says that it also gives his dragon wings a leathery look and feel, plus it waterproofs enough to enable some of his creations to ‘live’ in his bathroom. My Humpty is coming along great so far…I will post a picture when he’s finished. By the way did you drink the wine before you used the bottle? lol I covered my balloon with 2 layers of paper mache strips first (the balloon won’t shrink) then used a layer of paper clay. I discovered that using the paper clay directly on the balloon causing the shrinking you encountered. Hope your day is going well. Thanks again for all your help. You have taught me so much! Help Jonni I’m at my wits end! I’m trying to put the arms & legs on Humpty and the tape won’t stick to the body. How do you get it to stick??? Hi Tina. I used one piece of plaster cloth over the wire to stick the arms and legs on. If you use tape instead, you’ll need to make sure the egg is completely dry. Tape won’t stick to damp plaster. Or, perhaps the tape can wrap all the way around the egg and back over itself, to hold the arms and legs on long enough so you can get some paper mache strips and paste on? If at all possible, though, use the small piece of plaster cloth. It worked really well. Thanks Jonni, I don’t have any plaster cloth so I’ll try taping around. My egg was thoroughly dry when I tried to get the tape to stick. Let you know what happens. I used your suggestion and put the tape all the way around. Since I didn’t have any plaster cloth I improvised. I took some gauze soaked it in joint compound mixed with a little water and used it like plaster cloth. Voila! It worked great!! I wouldn’t recommend it for large areas because it’s quite messy but for this it was fantastic. I’m glad you worked it out. And congratulations on finding a way to use the gauze and joint compound. I’ll bet that it’s quite strong after the paper mache is on. Love your Humpty Dumpty! Did you leave the bottom open? I’m going to try this for sure. Have a great day. Hi Tina. Yes, I left the bottom open, and I’m glad I did. It would have been hard to work on him if I couldn’t use the weighted wine bottle to hold him up. Be sure to show us your version when he’s done! Can you tell me what you dipped your cloth in when you were covering the balloon? I do believe I am heading to the store for supplies! I love your egg! On the book page you can choose the option “Read this book online” to see it in your browser, if you don’t want to actually download it. As always, love your sculpture! Forgot to ask – have you found a regular place to find the gallon of Elmer’s glue? I have the hardest time finding that size at hardware stores, etc. and end up having to mail order it. Also seconding your recommendation of the powdered Elmer’s – I’ve lived in the really humid deep south and found that the long drying times mean that thanks to insects (it’s SO odd what they think is tasty) and mold many other types of paste were a bad idea. I get the gallon size of Elmers at both of my local hardware stores – Lowes and “Do it Best.” Back in Oregon I bought it at Ace Hardware. Maybe if you mention which state you’re in, one of our other readers can direct you to the right store? And thanks for confirming that the Elmer’s Art Paste works well in humid areas. It was a guess on my part, but now I feel more comfortable recommending it. I buy a gallon of glue at ACE Hardware. We have the best people in the world working at the one here. Once again I am in awe of your work. I have just started to really work in paper mache and hope that in the future my work will look as amazing as your projects. Love your videos. You make it all look so interesting and easy. Jonni I just love your egg. He turned out great. When my children were young we use to make paper mache things from balloon forms, I think they liked it. You are certainly a great teacher and an inspiration. It has been a few day since I’ve played with the paper clay, and now I want to get right back to it. Thank’s once again for sharing your work. I love it. Diann, you do have a cool piece, even if I had to turn my laptop upside down to see it. Did you use a wire armature? I love your colors. Thank you Christine. I did use a wire armature. I use the florist wire that is covered with cloth. The tape and paper stick better to it. Now I need to paint the base black. The stain doesn’t cover the glue. I love watching your videos. You are super talented. I have only done some paper mache as a child and am itching to try some. 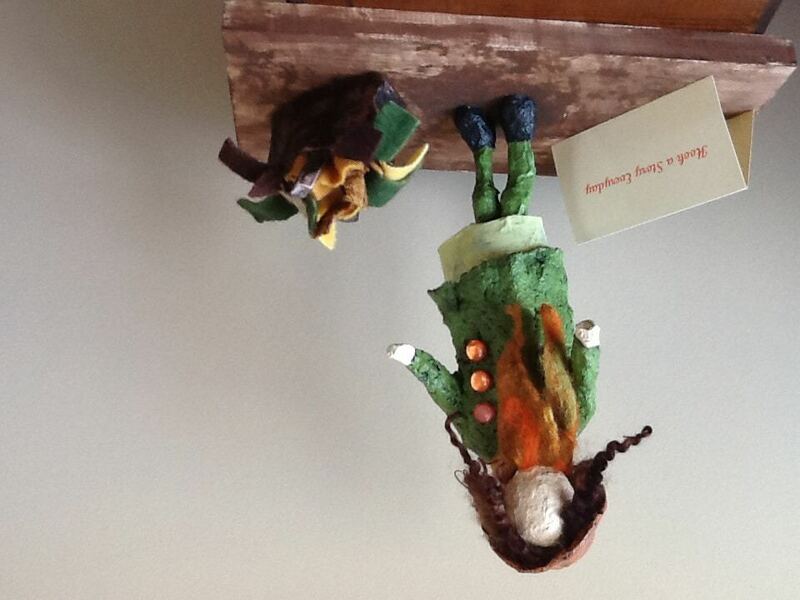 You mentioned making the hen from the Humpty Dumpty illustration. I hope you do a video of her too! I would love to try making the hen. I love chickens and it would be a great project to try. Hi Laurie. I will definitely post a video when I make the chicken. 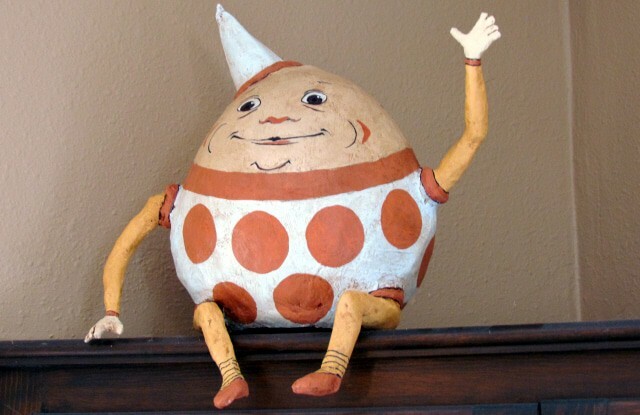 I don’t know when I’ll have time to do it, but I hope I can do it soon – I think it would be nice for Humpty to have someone to hang out with, don’t you? When I first saw Mr H Dumpty, I thought, hmmm…he’s cute. Then while watching the video, he became more. The way that you teach and sculpt brings so much to the viewer. Its like you instill life into your work, but more. Its almost magic. LOL I’m sure someone (or a bunch of someones) has indeed done studies on pathos, but for me I like comedies and happy stories with some suspense thrown in. I figure with kids, real life comes soon enough. 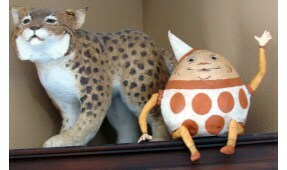 I like that Humpty was going around making people happy… hey, just like your sculptures and your blog! I totally love your Humpty Dumpty. I just have to make one too. As a child I loved the Mother Goose stories and this made me so home sick for all the memories. Thank you so much. Your is just so happy and I just know you will love him in your kitchen. Oh how did the stairs finish up did you show them finished? Hi Artis. I’m glad you like the little guy. My stair project is only slightly more done – I ordered one of the treads to see if I liked them, and I do. It makes a huge difference. Not nearly as nice as oak stairs, of course, but way better than the icky wood I was stuck with. Then I got sidetracked with a kitchen project that involved taking the reciprocal saw to the counter, so I think I’d better get that taken care of before I finish the stairs. And my book is languishing, of course. There’s something about spring (or the promise of spring, in our case) that puts me in the mood for taking things apart and, hopefully, putting them back together again. I’ll post a photo of the stairs when they’re done, for sure.